Waterloo taxis offers 24 hours a cheap and reliable Heathrow taxi from London Heathrow airport. It has never been easier to book a taxi from London Heathrow after having stress from your flight. Heathrow taxis are provided by Waterloo Cars London, we have been serving safe minicabs and taxis from airports for many years. If you are in search of Gatwick taxi from Gatwick airport to London, then Waterloo Cars always has minicabs, we provide cheap taxis from Gatwick airport to Central London or any destination in United Kingdom. Book online taxi with a five star rated minicabs & Gatwick taxi service from airport to any London postcodes or travelling from airports to airport. Book online Stansted taxi from London Stansted airport. Whether you are looking for a taxi from Stansted airport to a Central London Hotel or any London postcode. Waterloo Cars provides 24/7 minicabs and taxis near Stansted airport at fixed fare. Just type taxi near me in your phone when you are in need of a cab or taxi from airport and get a taxi near Stansted. We have been serving airport transfers and taxis from Luton airport for many years. Minicabs, taxi from Luton airport has never been easier but Waterloo Cars taxis has made this possible for all our passengers by providing free meet and greet service at Luton airport. Book Luton airport taxis with us to avoid hassle after your flight. Heathrow Airport is the busiest airport in the United Kingdom and the third busiest in the world. It handled a record number of more than 75 million passengers in 2016. 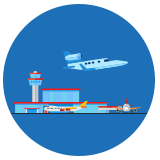 All that means you need to carefully plan to arrive on time in order to check-in for your flight or getting out from Heathrow after a stressful flight. The best way to do this is to get a taxi from Heathrow to avoid stress and hassle with your airport transfer. Many people use Heathrow taxi as it is the most popular way of transferring to and from the Heathrow airport London. If you have a booked flight and know when you should land in London, call our cab company near airport and book a cheap minicab, taxi from Heathrow to Central London or any other destination. Waterloo Cars has especially allocated a fleet of cars, cabs and minicabs for Heathrow taxi service near all airport terminals to provide an excellent Heathrow taxi service from all Heathrow terminals. Our five star rated Airport Transfers London taxi Heathrow office branch is located at Hanworth Road, London, Hounslow TW4 5LE and it is only few minutes drive from Heathrow all terminals. We always aim to serve a brilliant meet and greet and customer service to all our travellers. Gatwick Airport is the second busiest airport in the United Kingdom. Considering the fact that it is 30 miles away from Central London, it might be tricky to get there in time for your flight. Our professional staff at Waterloo Cars can help you calculate the optimum time needed for a taxi from Gatwick Airport and take you safely to your desired destination by using the quickest route. Whether you are looking a group pick up from Gatwick airport to London or an individual taxi transfer, Waterloo Cars at Gatwick is always your best choice taxi service from and to LGW Gatwick airport. Stansted Airport is considered to be the fastest growing airport in England with over 17 million passengers in 2017. The roads to the Stansted airport are often full of cars, which is why the convenient option is to get a cab, taxi from Stansted. Waterloo Cars can offer competitive prices for minicabs taxis to and from Stansted airport. Our taxi service from and to Stansted airport is a family run business for years and we have been professionally providing minicabs from London Stansted. More than 12 million passengers visit the Luton airport each year. 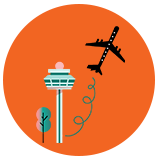 As an international airport, it fares people to and from various world destinations. 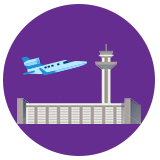 If you have booked a flight that takes off from or landing at Luton Airport, make sure to book a cab, minicab or taxi from Luton airport. Waterloo Cars offers the best cheap taxi fare for this 46 kilometres Luton airport journey. Waterloo Cars has been serving minicabs, minibuses cabs, private hire vehicles and taxis from Luton airport for many years. Southend Airport is located approximately 65 miles from the Central London. If you are looking for a way to get there in time, book a private hire vehicle or taxis and cabs with Waterloo Cars London taxi office to get a cheap fare for your Southend airport transfer. Just book an online taxi service from Southend airport via using our online taxi and minicab booking system and you can have a taxi from Southend airport straightaway. Whether you are visiting London for the first time or just heading for an international trip, hiring an airport taxi service will save your time and provide you a hassle free airport transfer and other London city journey. Waterloo Cars always serves its travellers with an admirable and professional meet and greet service at all London airports. 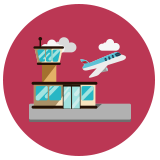 We will monitor your flight and make sure that the cab, taxi, minibus or even a chauffeur driven car is at the airport waiting for you at arrival with a name sign 30 minutes upon your arrival.